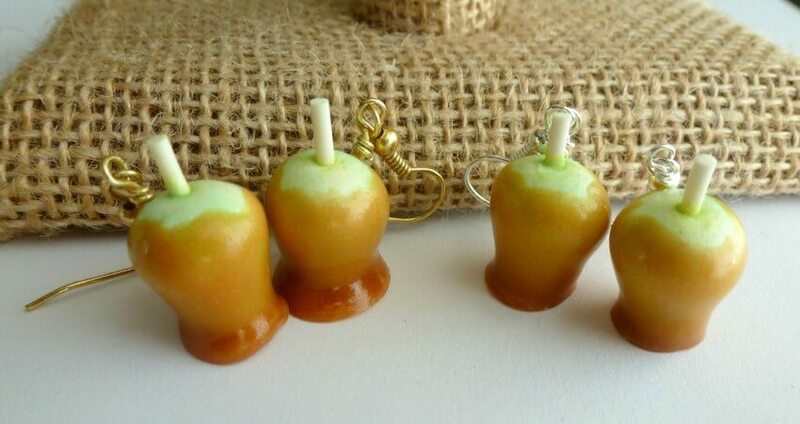 As a symbol of fall and of Halloween, these cute caramel apples would work well throughout the fall and well into winter. 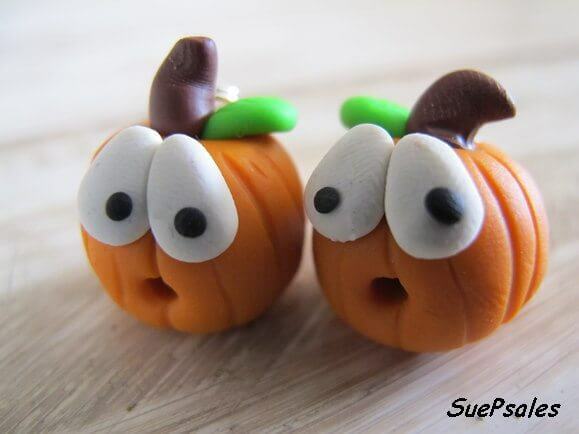 I love the way these pumpkins look like cartoon characters, don't you? 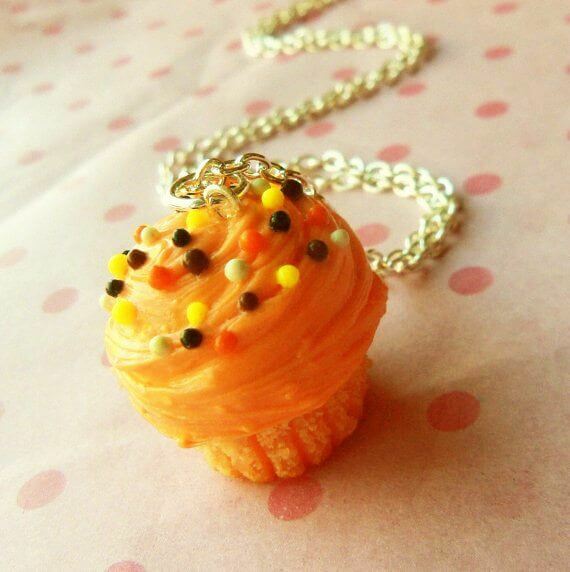 This cupcake looks good enough to eat, and it certainly has the whole fall colors thing going. 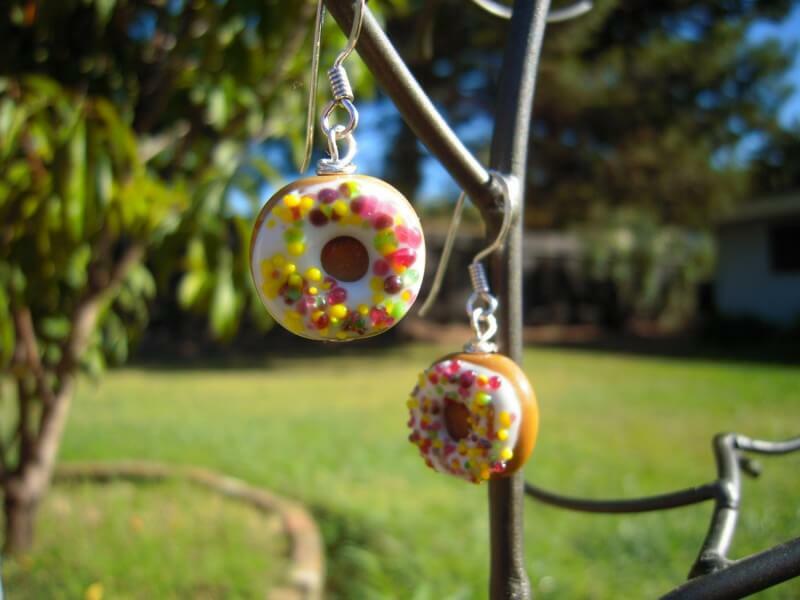 Not only are they donut earrings – but someone has even taken a bite! 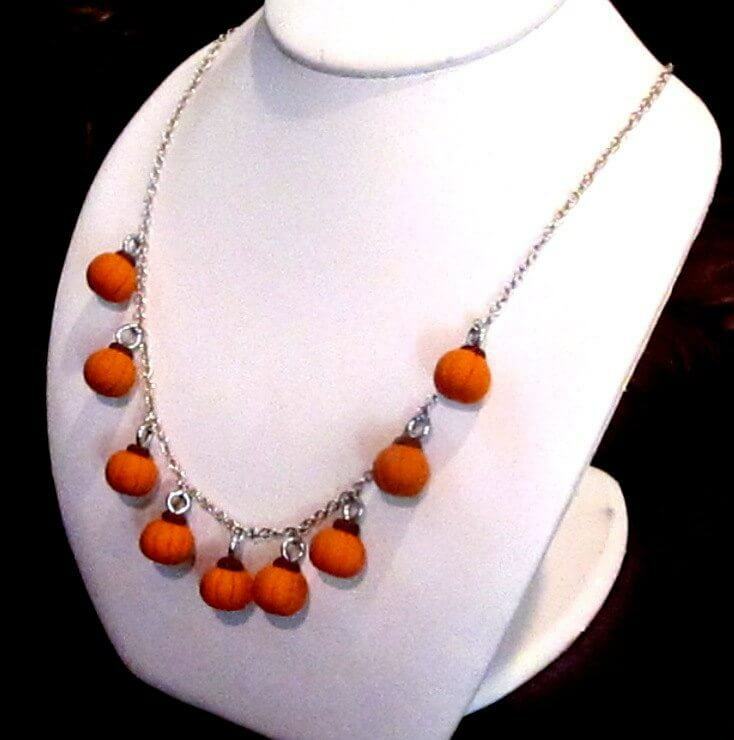 These pieces are great if you want something a little different, because they have that whole vintage look. 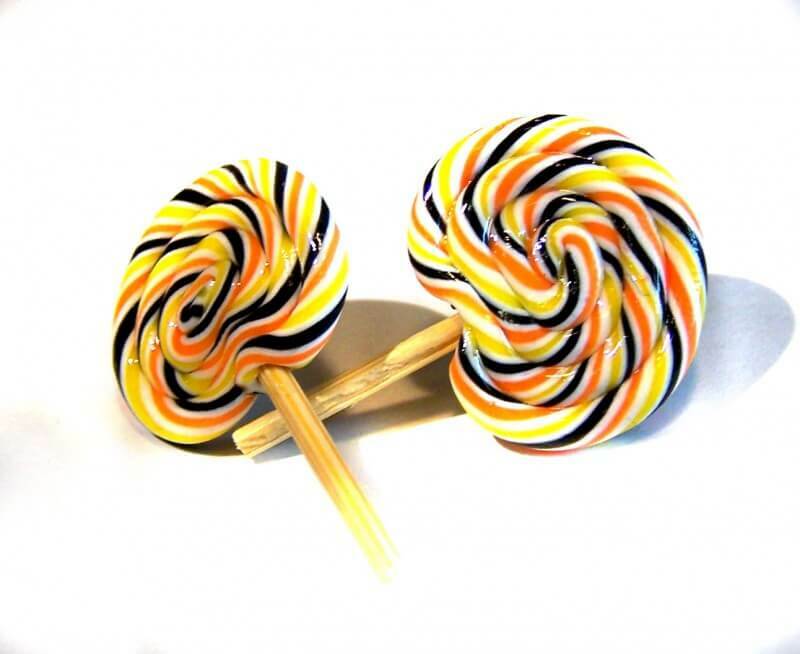 I think it's the colors of these lollipops that make them seem like Halloween. Whatever the reason, they sure are stunning. 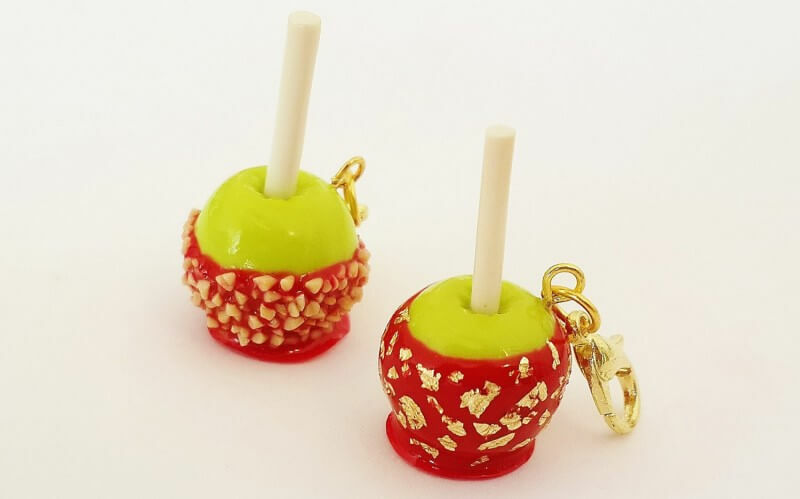 I love both styles of these charms, although the ones with gold flakes do seem a little better to me. What about you? I absolutely love this. 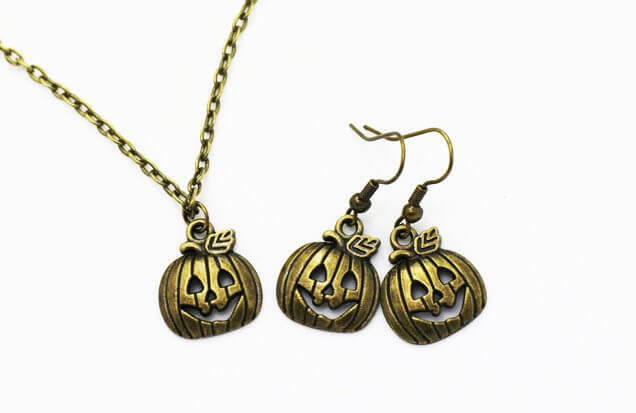 The necklace is very Halloween-like and very unique. 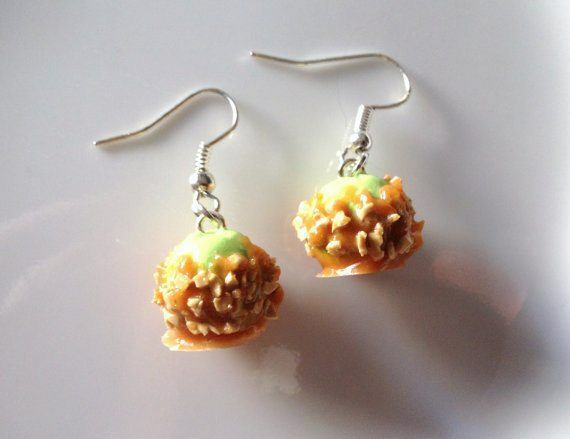 Have you ever thought about hanging pumpkin pie from your ears? 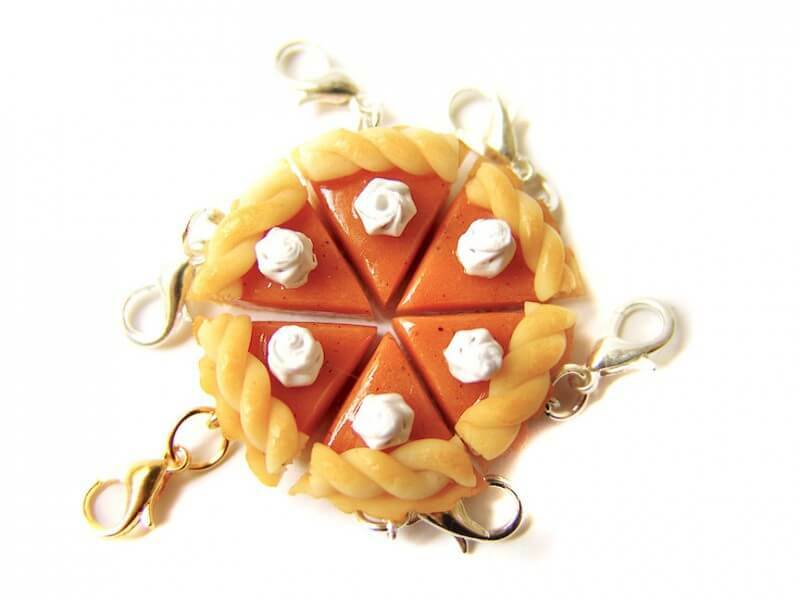 If not, these pie slices might make you reconsider. Sometimes the Halloween theme doesn't come from the item itself, but from the colors – this is another case of that. 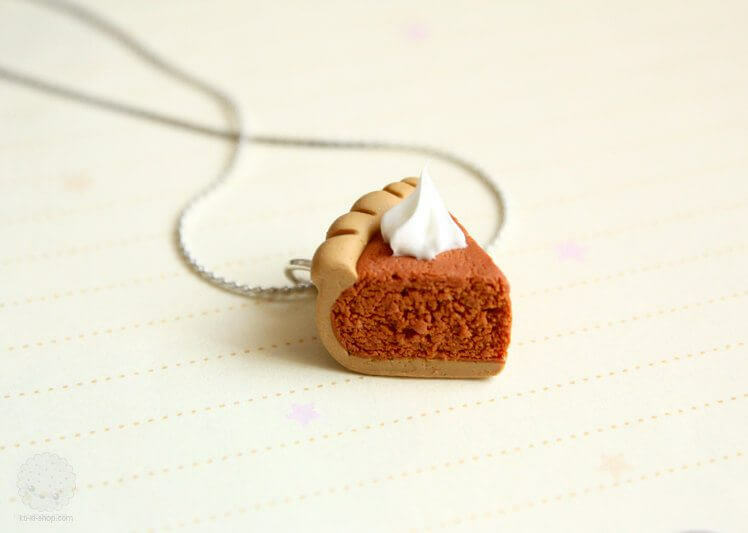 Here's a pumpkin pie slice you can hang around your neck – just don't try to eat it. One of my favorites on this list! 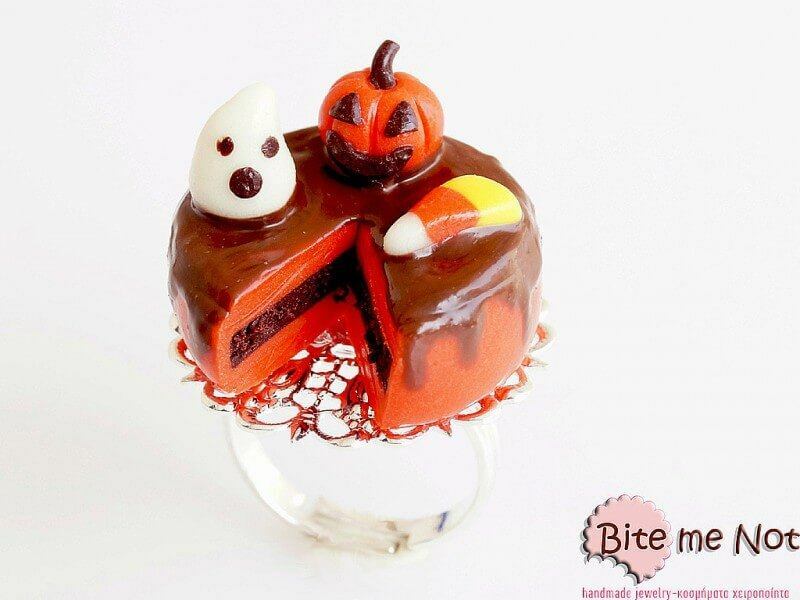 I'm not sure that a ring like this would be very practical, but it does look cool. These pieces look exactly like mallowcreme, so hopefully no one will try to eat them. 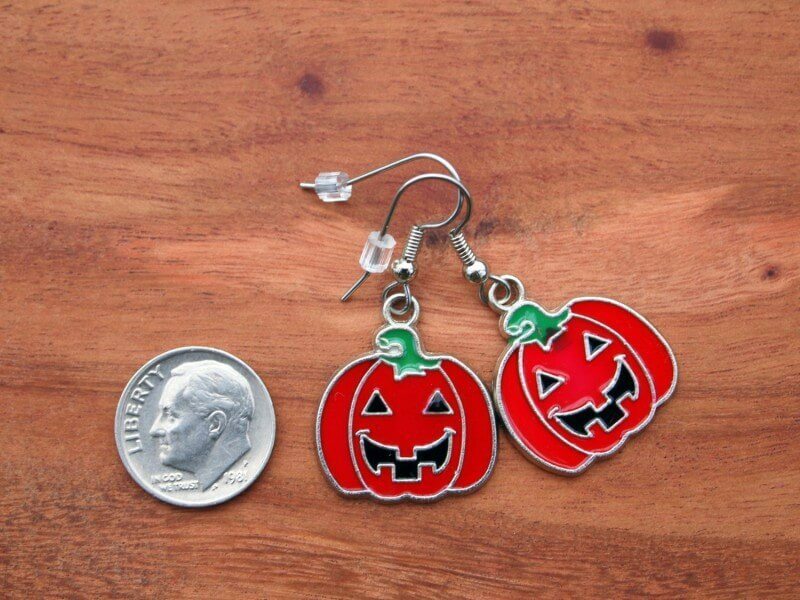 I love these very surprised pumpkins, they also have that homemade look, so everyone would wonder where you got them from. 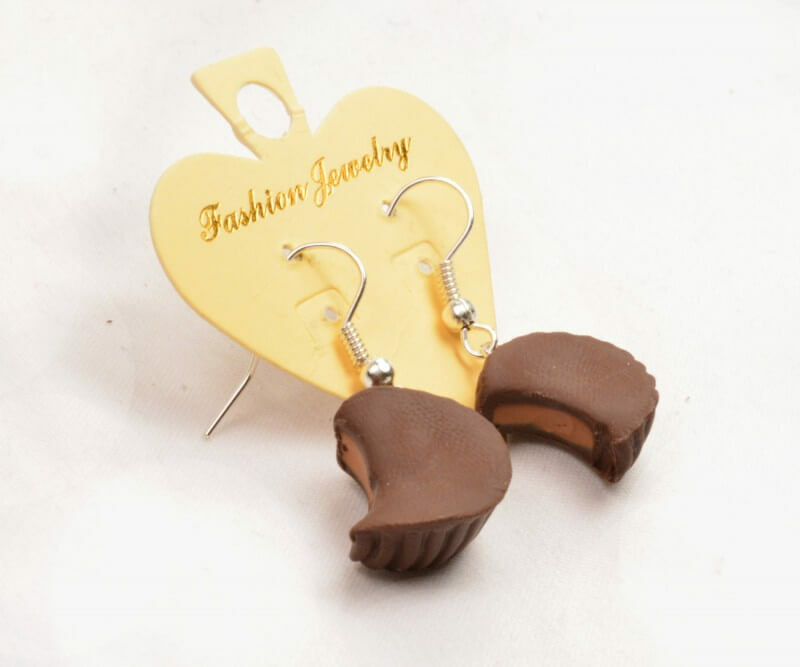 With these earrings, the fact that the peanut butter cups are bitten into is a good thing. They wouldn't be as recognizable if they were whole. 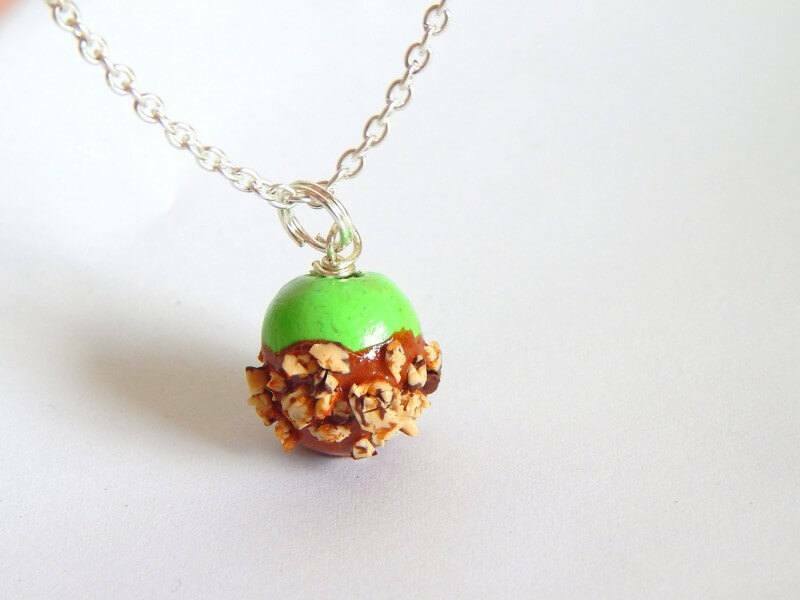 I love the way this one looks, particularly the way the green and the caramel contrast. 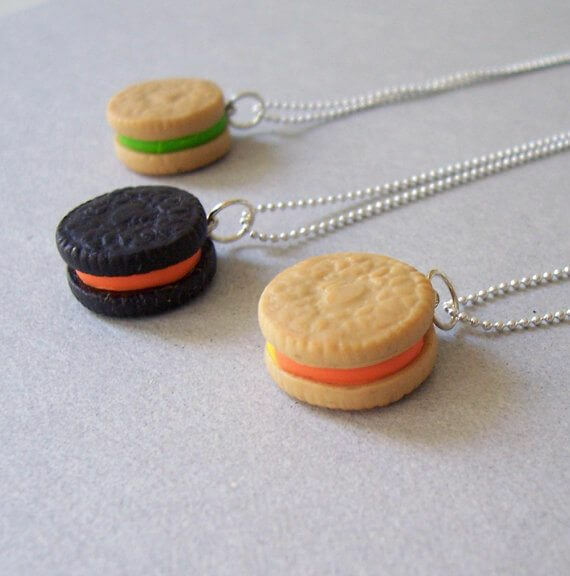 It would be great fun to wear at a party. 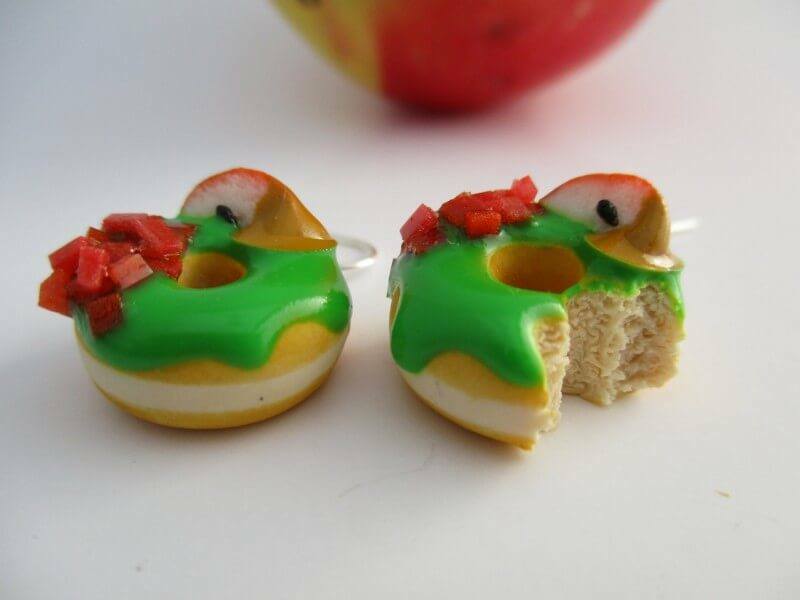 These would make a great gift for anyone who likes donuts. 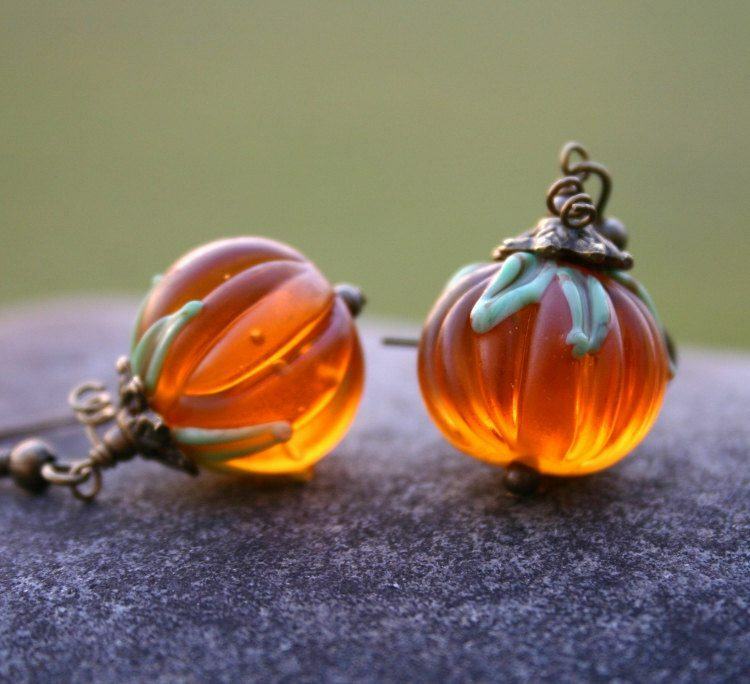 These actually look very elegant and they'd even work well with some Halloween costumes. 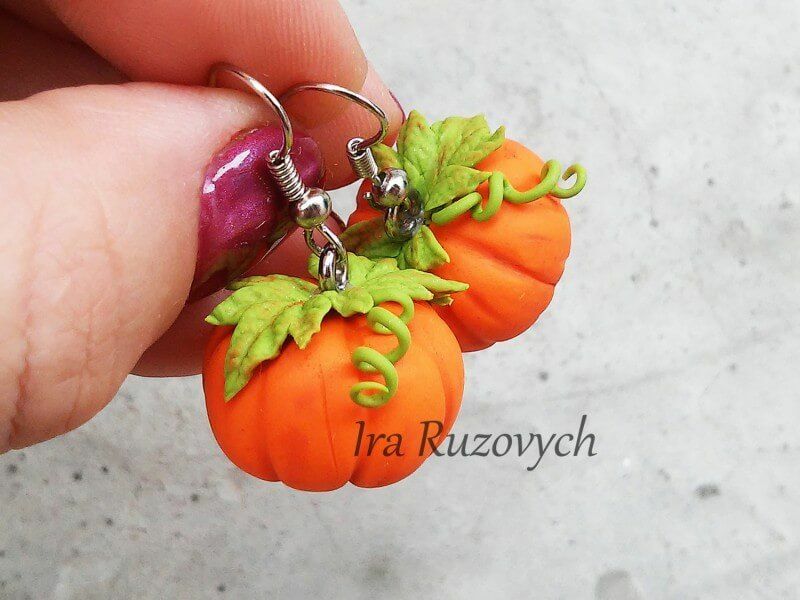 These look tiny, but cool – and perfect Halloween colors. A lot of time must have gone into making these, because the detailing is very well done. 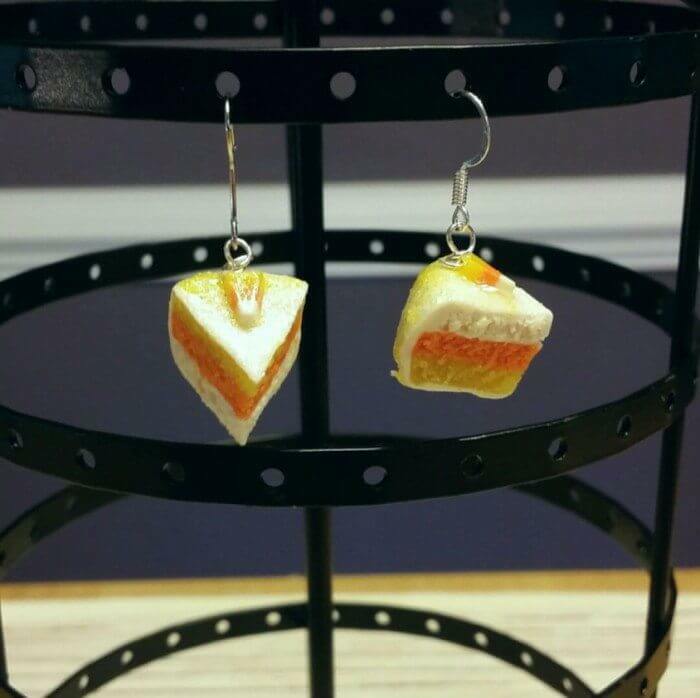 To me, this looks like a candy corn cake, which is doubly cool. 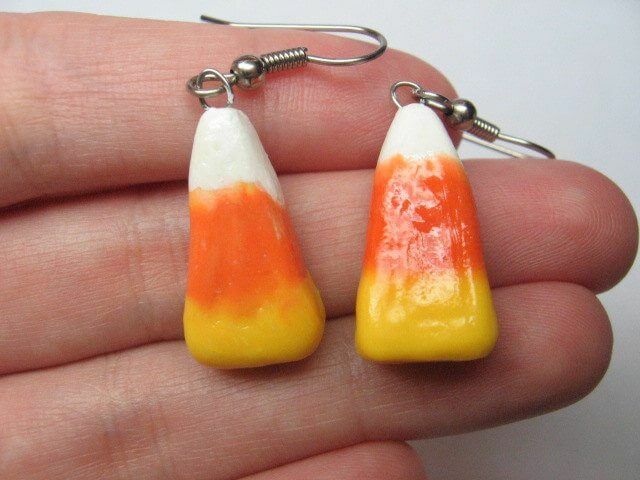 Speaking of candy corn, here are some relatively large candy corn earrings, aren't they cool? 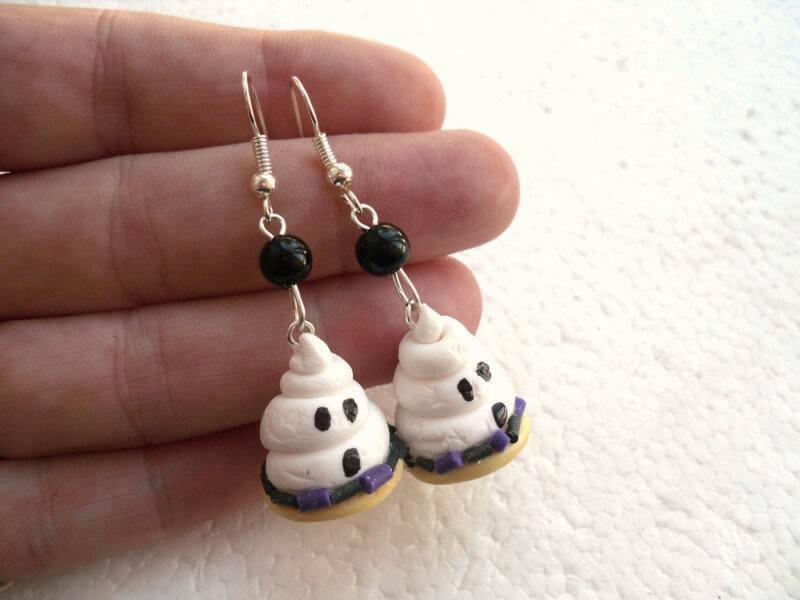 These donuts are one of the few examples of stud earrings on this list, and the attention to detail is fantastic. 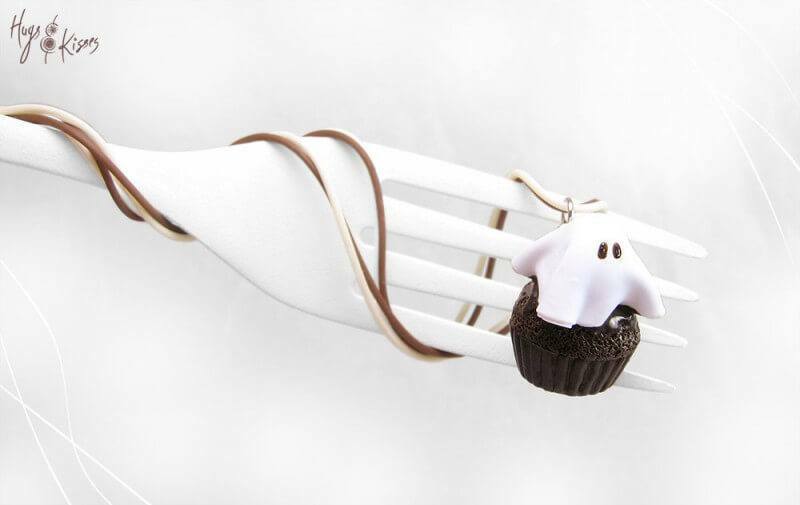 The ghosts on here are cute, and because it is a charm, you could use the cupcakes on all sorts of things. On first glance I thought this one was a hat, but it's actually a detailed cake that's decked out in Halloween colors (and a bit of glitter). 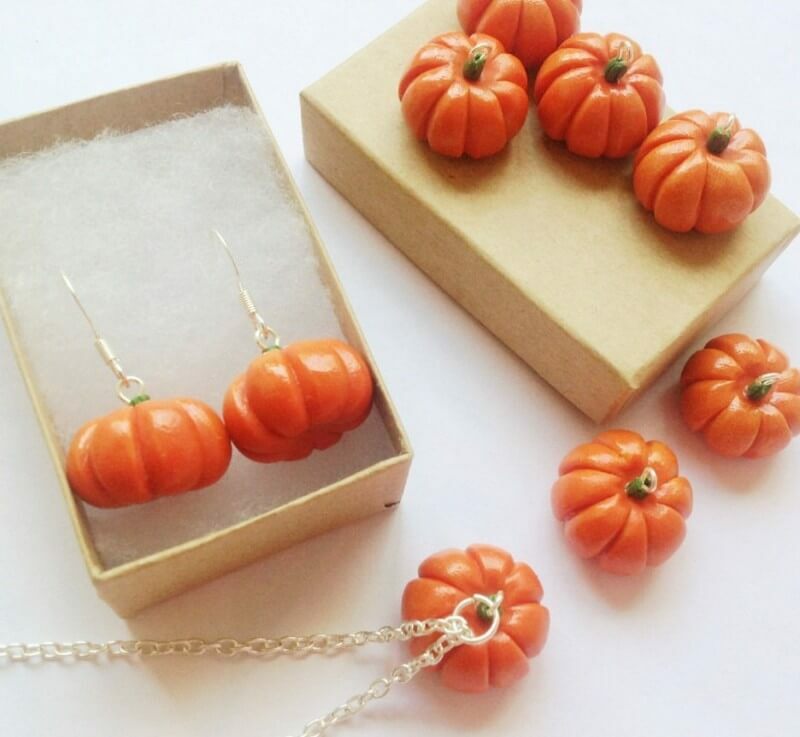 Why settle for one pumpkin? 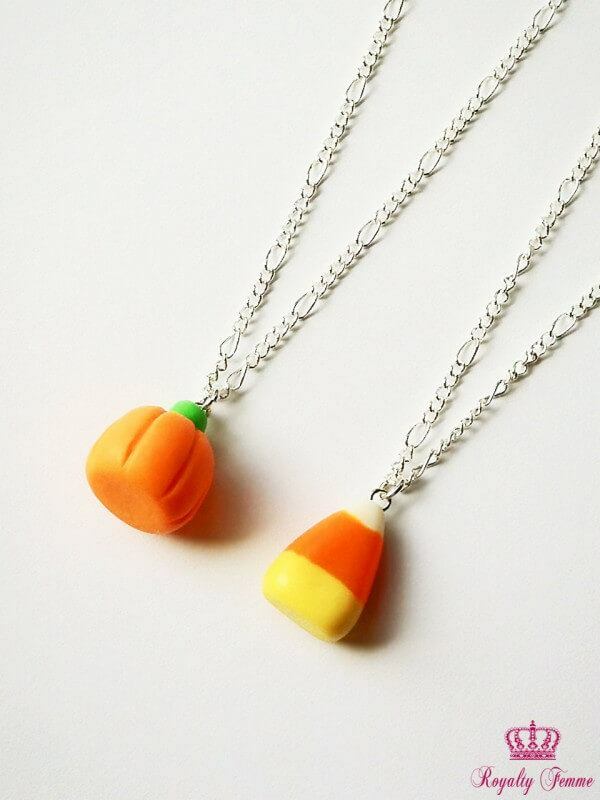 This necklace manages to look both seasonal and refined by having multiple pumpkins. 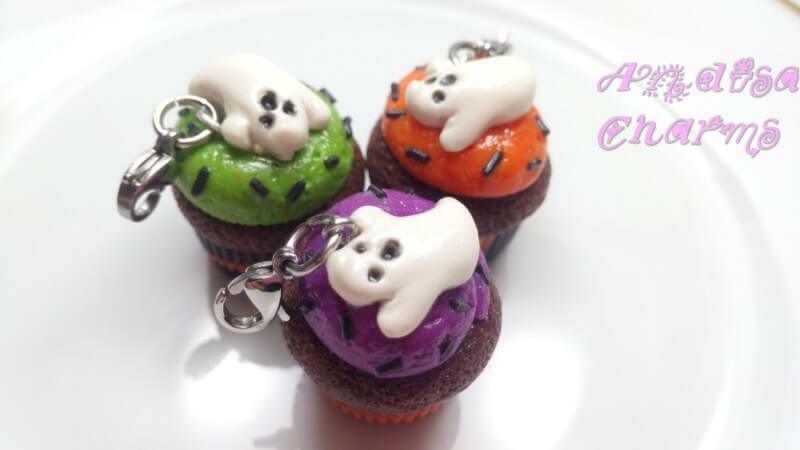 Halloween colors, cake and a ghost…what's not to love? 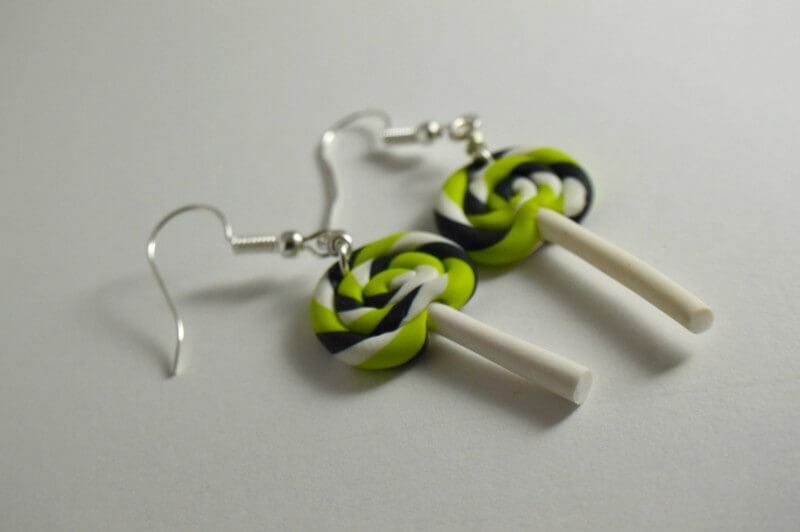 Lollipops seem to be a pretty common in this list, but these ones are a bit different in style and in color. That's what makes them fun and unique! 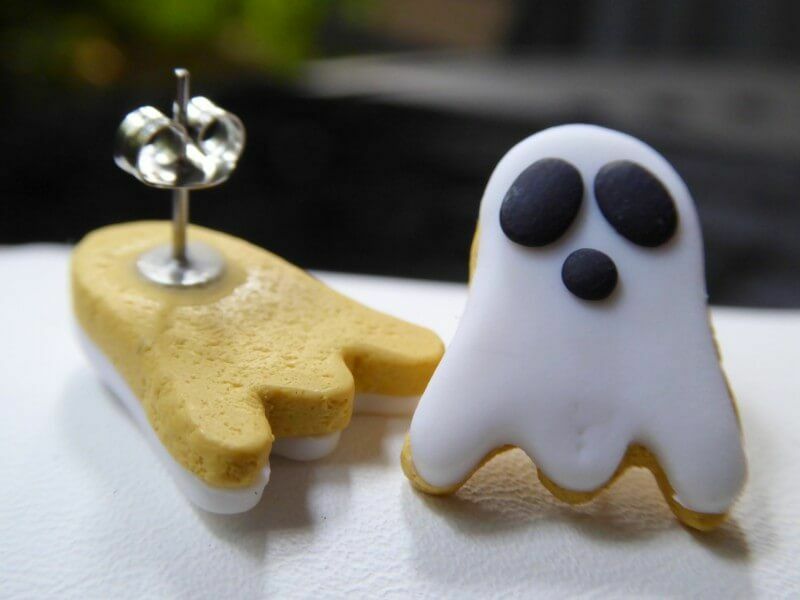 These ghosts are cute and simple, although without looking closely, most people probably wouldn't realize that they are also supposed to be cookies. 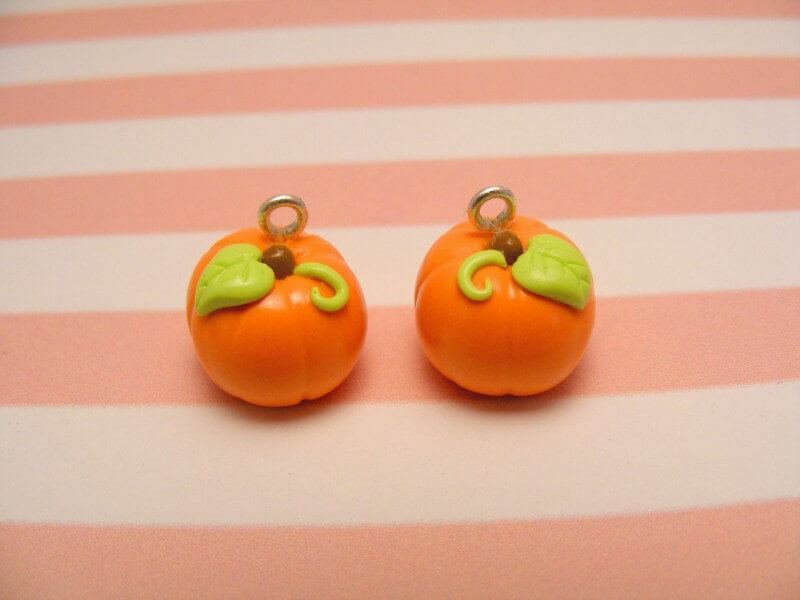 This cute take on pumpkins reminds me of the pumpkins from a Disney movie. Here's a fun one – actually, making cookies like that would be fun too. 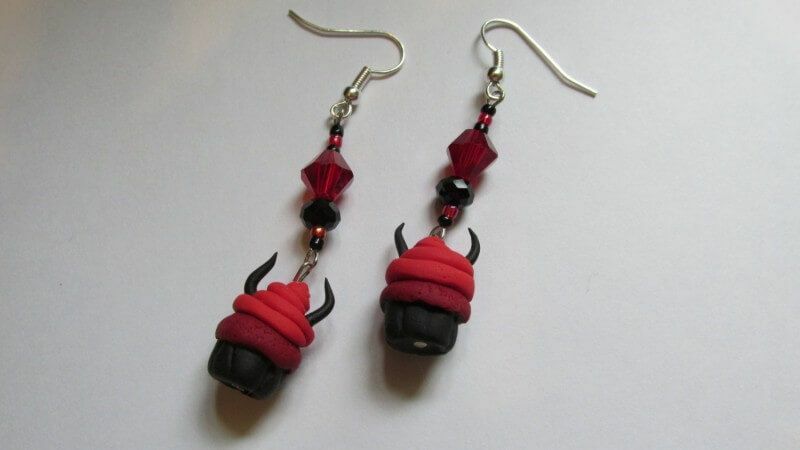 The inspiration for these earrings is easy to recognize and the creator did a great job of pulling them off. 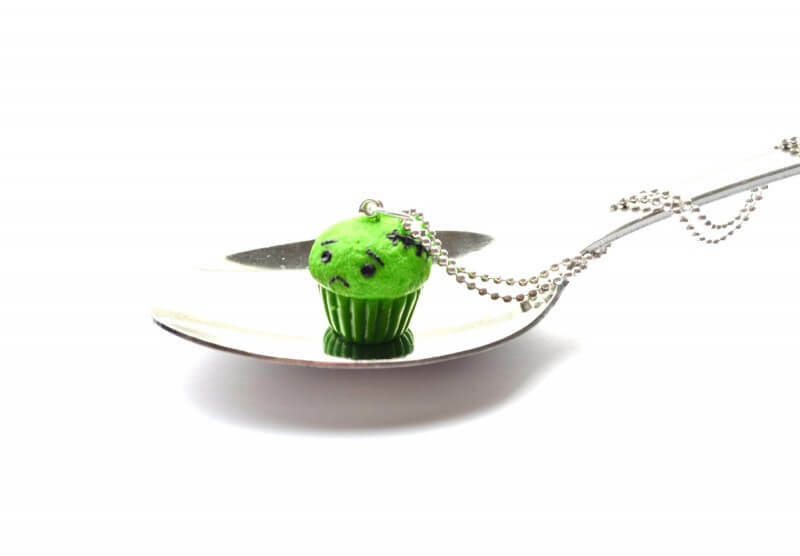 A zombie cupcake necklace. 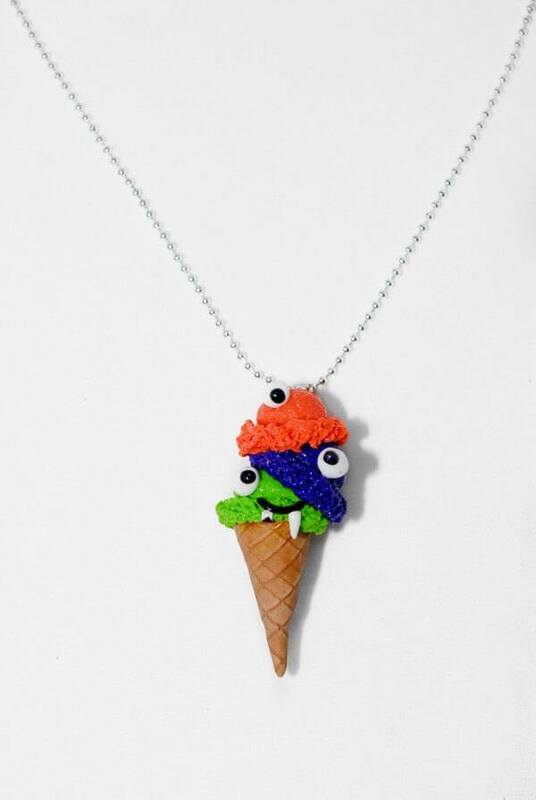 That might be a mouthful, but that is exactly what this necklace looks like and exactly what it is supposed to be. 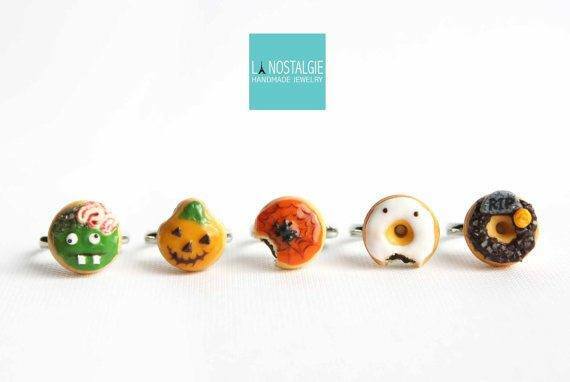 The image is smaller than I'd like, but I had to include these nifty donut rings – they perfectly suit Halloween. 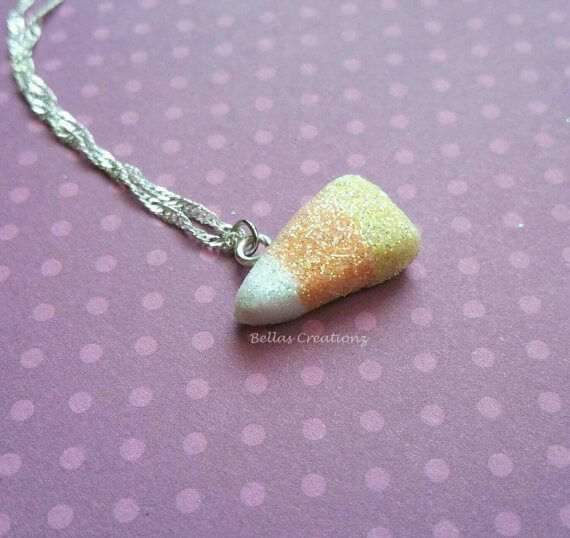 Want candy corn and glitter on a necklace? This piece has you covered. 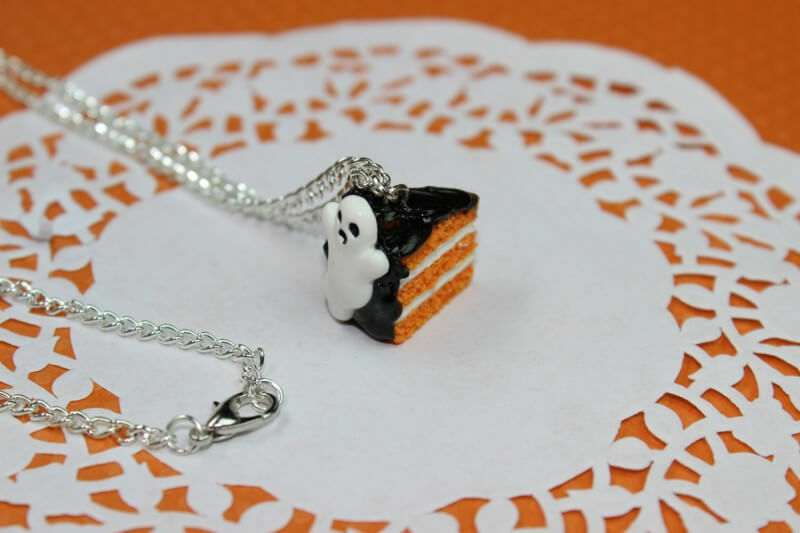 I had a hard time choosing just one item from this Etsy store, they have so many great items – but you have to admit, the ghost cupcake necklace is awesome. This piece of jewelry is a fantastic talking point and I doubt you will find anyone else wearing something quite this cool. 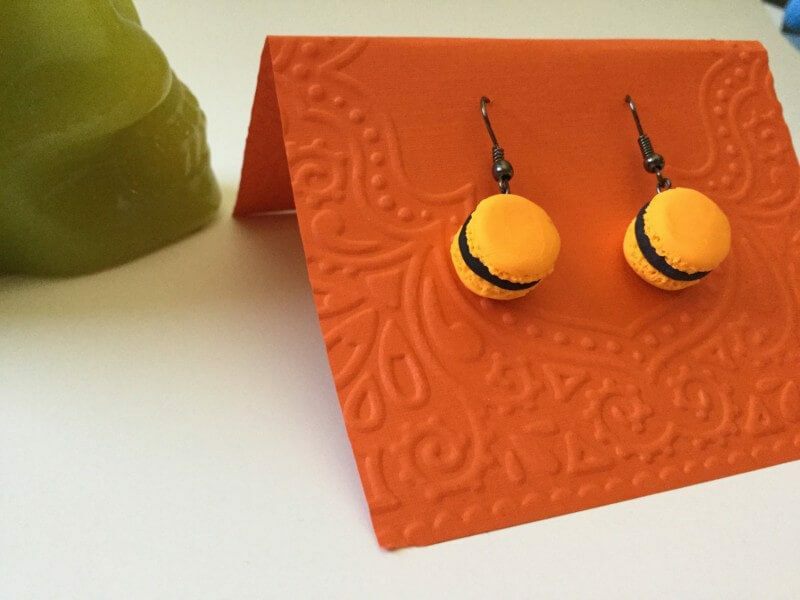 If you want food for jewelry, why not go all the way with a jewelry set? 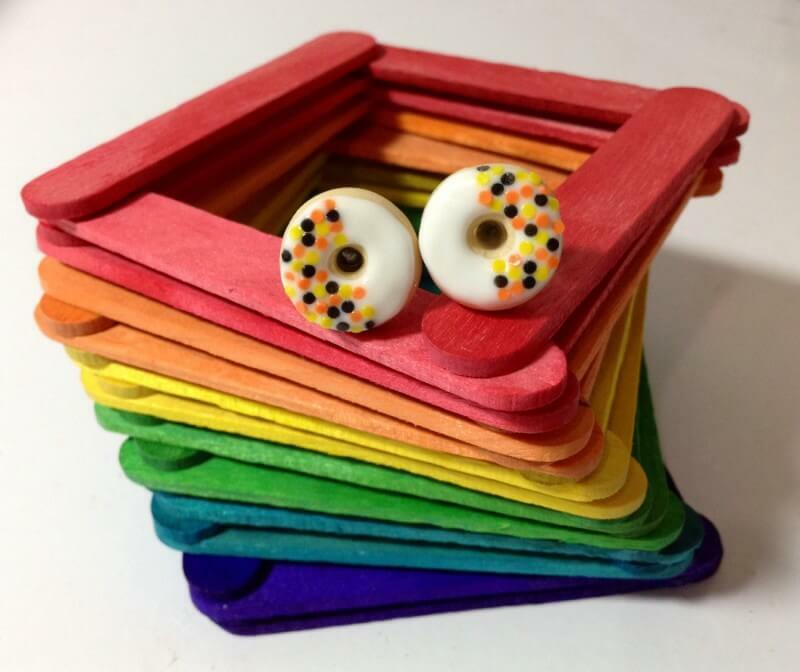 Even though the pieces are sold individually, this would also make for unique matching jewelry between friends – especially if there were six friends. 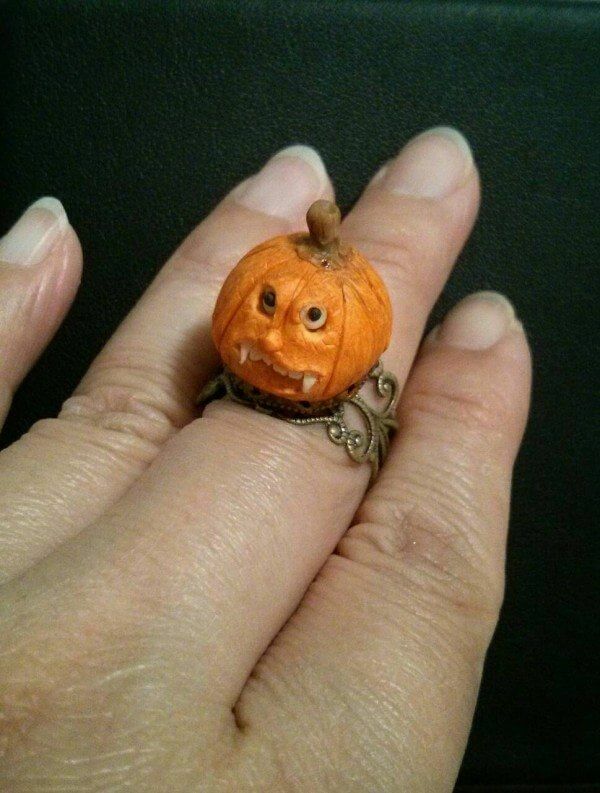 This pumpkin ring looks a little too realistic – but that's part of the fun. 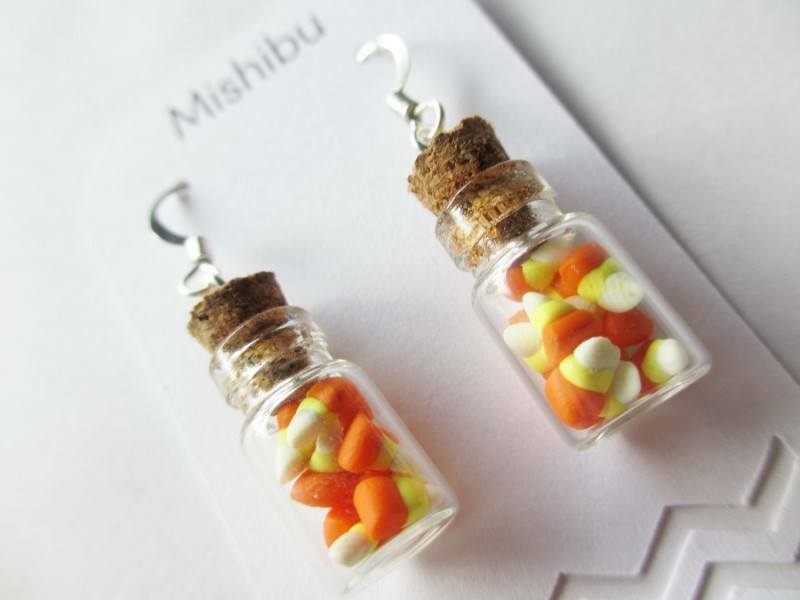 Here's a unique one – small pieces of fake candy corn in jars. Love it. 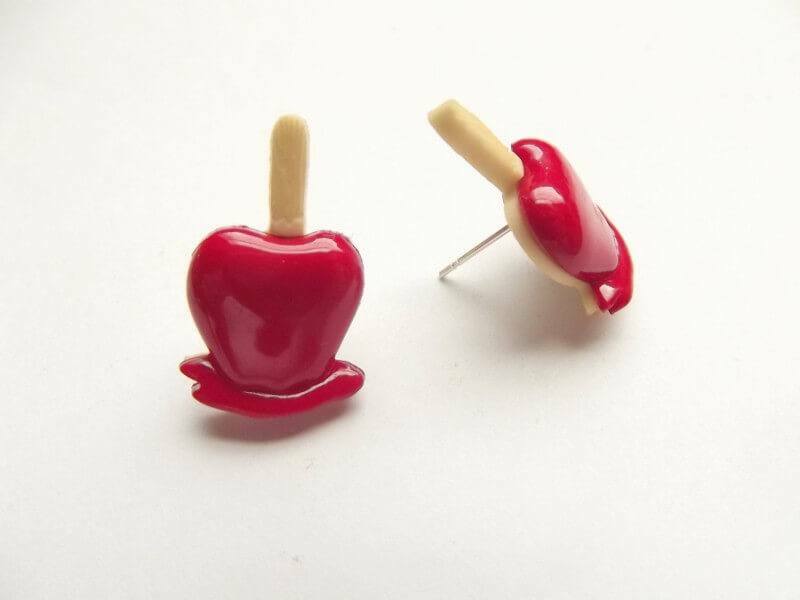 I have featured a few different examples of caramel apple earrings, but these ones do look cool and would be easy to wear. 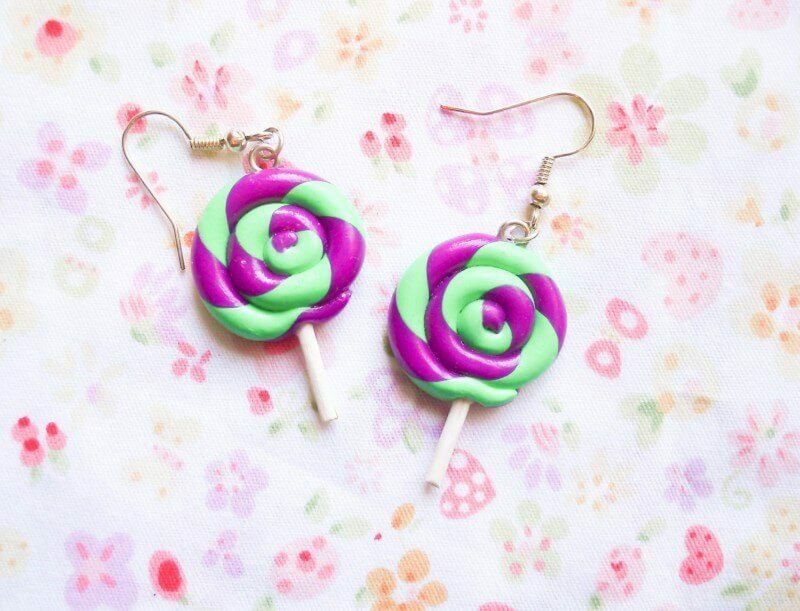 That's the fun thing about Etsy…people can use one great idea and make their own creative twist on it! Let's close this list of with a unique piece. 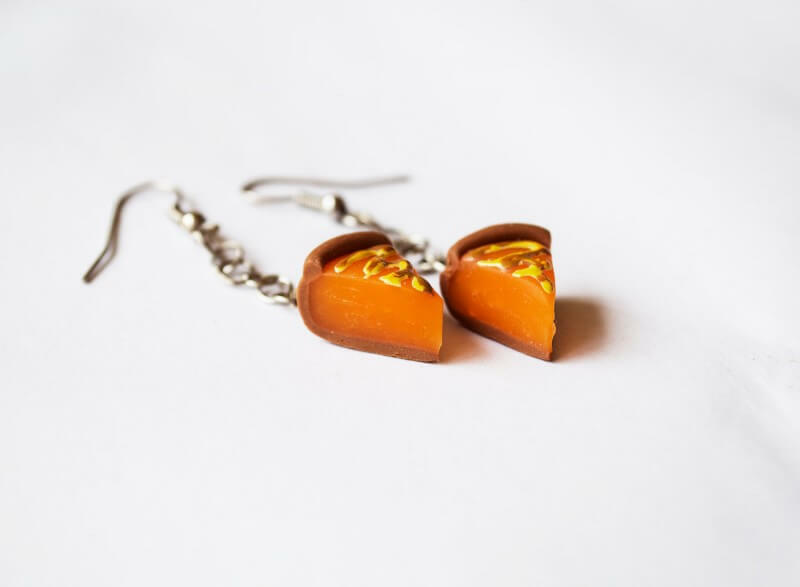 I love the glasswork in these earrings and they really stand out. Thanks for the feature Cassie, I really appreciate it. 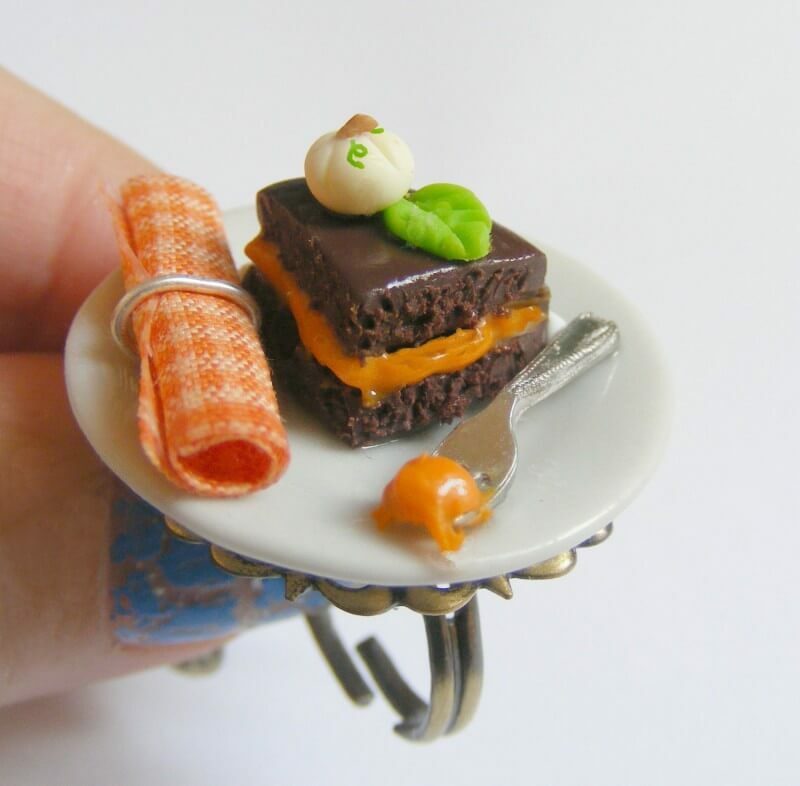 I just LOVE the Polymer clay ones! 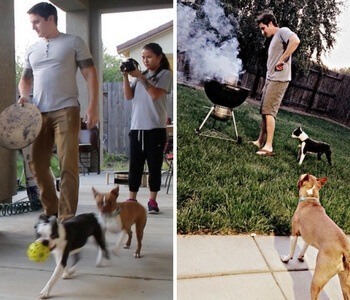 Those are always the cutest/easiest ones to make. Really cute right? 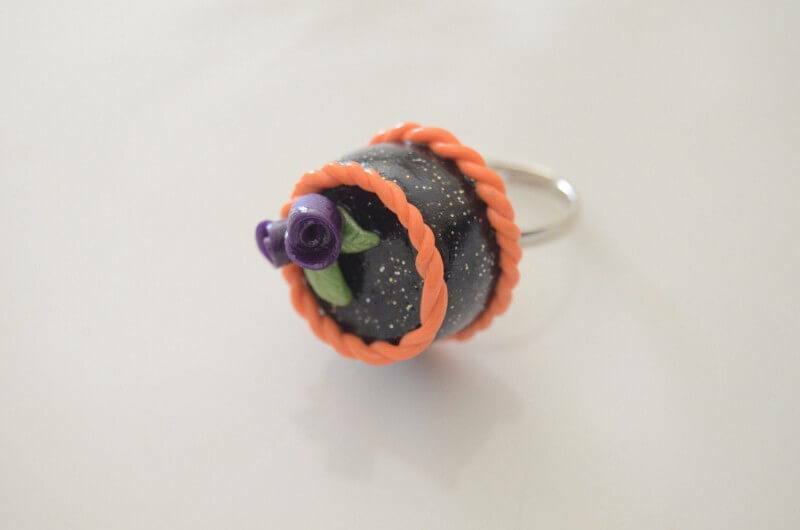 Etsy creators are so clever!